This interactive T4 guide provides details on the 2017 T4 – Statement of Remuneration Paid. 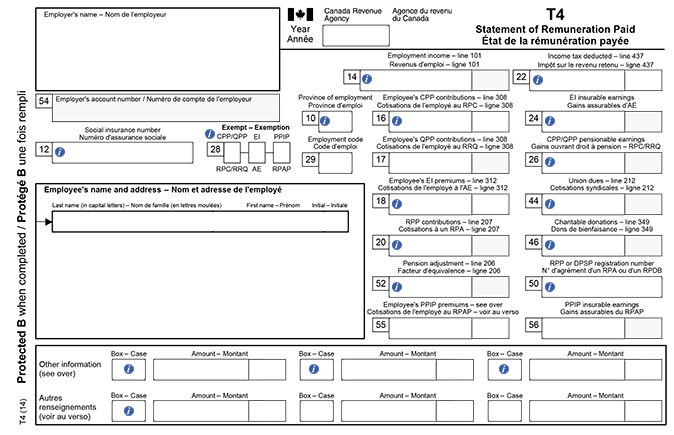 If you would like clarification on any of the information provided or more help in preparing your tax return, please contact the Canada Revenue Agency (CRA) at 1-800-959-8281, or at their web site at www.cra-arc.gc.ca. NOTE: Box 14 also includes amounts reported in the “Other” information section of your T4. The values of the taxable benefits that are recorded are represented by footnote codes for 2018. The following are the main taxable benefit footnote codes used by The City of Edmonton Code 34 and Code 40. Reports the amount of Canada Pension Plan (CPP) contributions deducted from your 2018 remuneration. The maximum employee CPP contribution for 2018 is $2,593.80. Reports the amount of Employment Insurance (EI) premiums deducted from your 2018 remuneration. The maximum employee EI contribution for 2018 is $858.22.